About: Apply Masonry style to album or image thumbs. + ADMIN: Added new option "Animate thumbnail on hover"
+ Further and final improvement for file type markers in Overlay Ex mode. Now sensitive to file extensions. 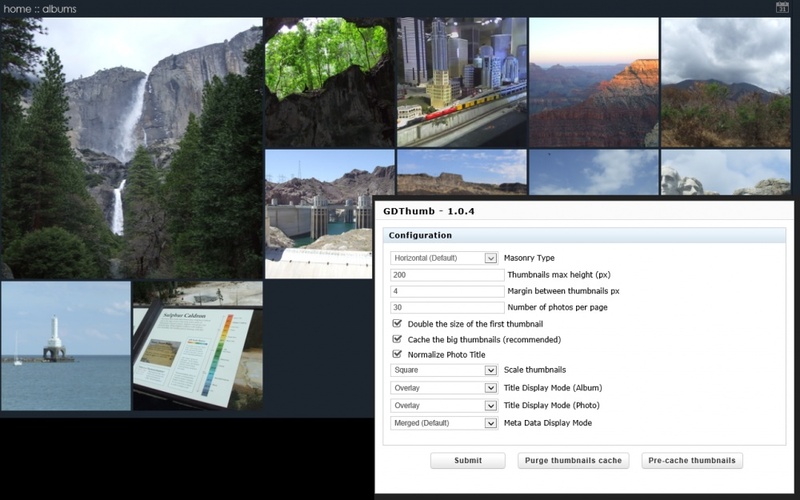 Supports image, video, music, pdf, doc, xls, ppt formats with associated markers. + ADMIN: new sub option "Block for Panoramic Photo Page" for "Double the size of the first thumbnail"
This is first attempt to support Piwigo 2.7. While changes should be backward compatible, caution is advised. - Plugin maintenance code converted to use PluginMaintain class (Piwigo 2.6). This addresses some inconsistencies in DB operations handling. + Admin: New option "Normalize Image Title" - if enabled, images with Title matching File name would be shown as "Photo ID"